The Championships, Wimbledon is an annual tennis tournament first contested in 1877 and played on outdoor grass courts[a][b] at the All England Lawn Tennis and Croquet Club (AELTC) in the Wimbledon suburb of London, United Kingdom. The Ladies' Singles was started in 1884. Wimbledon has historically been played in the last week of June and the first week of July (though changed to the first two weeks of July in 2017), and has been chronologically the third of the four Grand Slam tournaments of the tennis season since 1987. The event was not held from 1915 to 1918 because of World War I and again from 1940 to 1945 because of World War II. The Ladies' Singles' rules have undergone several changes since the first edition. From 1886 until 1921, the event started with a knockout phase, the All Comers' Singles, whose winner then faced the defending champion in a challenge round. The All Comers' winner was automatically awarded the title six times (1887, 1891, 1895, 1907, 1908) in the absence of the previous year's champion. The challenge round system was abolished with the 1922 edition. Since the first championships, all matches have been played at the best-of-three sets. Between 1877 and 1883, the winner of the next game at five games-all took the set in every match except the All Comers' final, and the challenge round, which were won with six games and a two games advantage. All sets were decided in two-game advantage format from 1884 to 1970. The lingering death best-of-12 points tie-break was introduced in 1971 for the first two sets, played at eight games-all until 1978 and at six games-all since 1979. The Ladies' Singles champion receives a sterling silver salver commonly known as the "Venus Rosewater Dish", or simply the "Rosewater Dish". The salver, which is 18.75 inches (about 48 cm) in diameter, is decorated with figures from mythology. New singles champions are traditionally elected honorary members of the AELTC by the club's committee. [c] In 2012, the Ladies' Singles winner received prize money of £1,150,000. These records include the Amateur Era only, Dorothea Lambert Chambers (1903–1904, 1906, 1910–1911, 1913–1914) holds the record for most titles, with seven, and Lottie Dod (1891–1893) and Suzanne Lenglen (1919–1921) holds the record for most consecutive wins in the Ladies' Singles during the challenge round era, with three victories each. The record for most consecutive and most wins post challenge round during the Amateur Era is Helen Wills Moody (1927–1930), with four straight wins, and Moody holds the record for most victories in this era with eight (1927–1930, 1932–1933, 1935, 1938). These records only include the Open Era, since the inclusion of the professional tennis players, Martina Navratilova (1978–1979, 1982–1987, 1990) holds the record for most victories with nine. Navratilova holds the record for most consecutive victories with six (1982–1987). This event has been won without the loss of a set, during the Open Era of Tennis, by the following players: Billie Jean King in 1968, 1972, 1973 and 1975, Margaret Court in 1970, Evonne Goolagong Cawley in 1971 and 1980, Chris Evert in 1974 and 1981, Martina Navratilova in 1979, 1983, 1984, 1986, 1987, and 1990, Steffi Graf in 1992 and 1996, Jana Novotná in 1998, Lindsay Davenport in 1999, Venus Williams in 2000, 2007 and 2008, Serena Williams in 2002, 2009, 2010, 2015 and 2016, Petra Kvitová in 2011 and 2014 and Marion Bartoli in 2013. Lottie Dod was a five-time champion and is the youngest ever winner of the ladies' singles championships (15 years and 285 days). Charlotte Cooper Sterry was a five-time champion and is the oldest ladies’ singles champion (37 year and 282 days). Dorothea Lambert Chambers was a seven-time champion between 1903 and 1914. Suzanne Lenglen was a six-time champion. Helen Wills Moody was an eight-time champion between 1927 and 1938. Maureen Connolly competed in 1952, 1953 and 1954 and won the title on all three occasions. Althea Gibson won the title in 1957, the first tennis player of colour to do so, and successfully defended her title in 1958. Billie Jean King is a six-time champion overall and a four-time champion in the open era. Martina Navratilova is a nine-time singles champion, an all-time Grand Slam record in the Open Era for women (Margaret Court won the Australian 11 times). She won six consecutive titles from 1982 to 1987. Steffi Graf is a seven-time champion over a nine-year period from 1988 to 1996. Serena Williams is a seven-time champion. 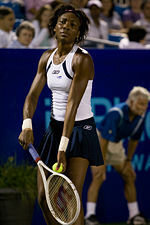 Venus Williams is a five-time champion. The Ladies' Singles plate (right) with the Gentlemen's Singles trophy (left). a Since 2009, Centre Court features a retractable roof, allowing indoor and night-time play. b Wimbledon entered the Open Era with the 1968 edition, allowing professional players to compete alongside amateurs. c John McEnroe is the only player to have been denied membership in 1981, because of his on-court behaviour during the championships. d Each year is linked to an article about that particular year's draws, but pre-1922 they did not have draws due to the challenge round system. In 1922 till the present they do have draws, but the years of 1925–1939 do not have draw pages with links, so it is linked to the year's articles instead. e "British Isles" (BRI) is used for players from the United Kingdom of Great Britain and Ireland (1801–1922), distinct from "Great Britain" (GBR) used for players from the United Kingdom of Great Britain and Northern Ireland (1922–present). f The tournament was not held from 1915 to 1918 because of World War I.
g The tournament was not held from 1940 to 1945 because of World War II. h Czechoslovakia (TCH, 1918–1992) split into the Czech Republic (CZE, 1992–present) and Slovakia (SVK, 1992–present). i Martina Navratilova was born in Czechoslovakia, but was stripped of her citizenship in 1975 when she defected to the United States. She became a US citizen in 1981.
j FRG is West Germany, but after unification became just Germany (GER) after 1990. "Ladies' Singles". wimbledon.org. All England Lawn Tennis and Croquet Club. Retrieved 2019-03-02. "Grand Slam Tournaments - Wimbledon" (PDF). usta.com. United States Tennis Association. Archived from the original (PDF) on 2011-05-20. Retrieved 2009-07-01. ^ "FAQ - Grass Courts" (PDF). wimbledon.org. IBM, All England Lawn Tennis and Croquet Club. Retrieved 2009-06-24. ^ a b "Tournament profile - Wimbledon". atpworldtour.com. ATP Tour, Inc. Retrieved 2009-07-05. ^ a b "About Wimbledon - History: History". wimbledon.org. IBM, All England Lawn Tennis and Croquet Club. Retrieved 2009-06-24. ^ a b c d e f g h "Ladies' Singles". wimbledon.org. All England Lawn Tennis and Croquet Club. Retrieved 2019-03-02. ^ a b c Barrett, John (1986). 100 Wimbledon Championships: A Celebration. Collins Willow. ISBN 978-0-00-218220-1. ^ Roberts, John (1998-08-05). "Tennis: Fast, fan friendly - but full of faults". The Independent. Retrieved 2009-06-24. ^ "About Wimbledon - History: The trophies". wimbledon.org. IBM, All England Lawn Tennis and Croquet Club. Retrieved 2009-06-24. ^ "About Wimbledon - Behind the scenes: The All England Lawn Tennis Club". wimbledon.org. IBM, All England Lawn Tennis and Croquet Club. Archived from the original on 2010-12-25. Retrieved 2010-11-12. ^ "2011 Prize Money" (PDF). wimbledon.org. All England Lawn Tennis and Croquet Club. Retrieved 2011-07-03. ^ Harman, Neil (2009-04-22). "No more soaked strawberries - Centre Court, Wimbledon, gets a roof". The Times. Times Newspapers Ltd. Retrieved 2009-07-19. ^ "Jolly snub for McEnroe; he's refused All-England". St. Petersburg Times. United Press International. 1981-07-10. Retrieved 2009-07-27. ^ Zenilman, Avi (2009-06-24). "Back Issues: McEnroe vs. Thatcher". The New Yorker. Condé Nast Publications. Retrieved 2009-07-27. ^ "History - Rolls of Honour: Country abbreviations". wimbledon.org. IBM, All England Lawn Tennis and Croquet Club. Retrieved 2009-07-17. ^ McCurry, Justin (11 March 2008). "'Ashamed' Navratilove regains Czech nationality". The Guardian. Retrieved 9 July 2016.